Definition – An Arque or Variant block are blocks with a tapered shape that can create smooth, graceful curved walls or glass columns in small spaces. Each of these blocks makes a 22 degree turn. Create a curved wall in a small space – Using 4 Arque glass blocks you can create a 90 degree turning radius in a space as small as 12”. This will allow you to create a walk in shower in a standard tub space (60” x 32” or 60” x 34”). Makes consistent grout or silicone joints in a curved glass block wall – Before the invention of the Arque block the only way to make a radius glass block wall was to use standard blocks and have a small mortar joint (usually about 1/8”) on the inside and a bigger joint (usually 5/8”) on the outside. Since the Arque block is tapered the joints on the inside and outside are the same size. 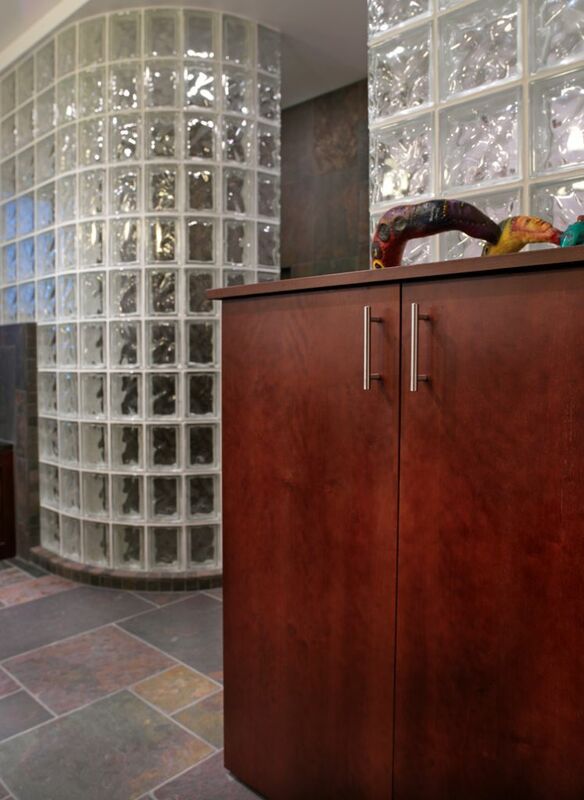 Less expensive than curved bent glass – Glass blocks will usually be about ½ the price of curved bent glass. Meets tempered glass codes for use in wet areas. Minimizes the effects of water spotting & maximizes privacy – Patterned glass blocks (like the wave, decora, icescapes and iceberg patterns) show very little spotting – a major advantage over clear glass shower walls – and provide privacy as well (which is nice for a shower or conference room wall). Can be made in pre–assembled sections – Curved blocks can be pre-made with the rest of the glass block wall to improve the finished quality of a project, make the installation easier (using a stack, anchor and grout system) and cut field labor costs. Use for a wide variety of applications – Create a curved walk in shower, partition wall or even a glass block decorative columns (you can add lighting for effect – can make for a cool look around a landscaping post or around a pool area). Arque blocks are more expensive than standard glass blocks – Non-shaped glass blocks are cheaper than the shaped units – so a radius wall using the old style method will have lower material costs (the drawback to this approach is it requires a high level of installation skill using the block by block masonry method). Available in limited sizes – The curved blocks only come in two sizes which may limit some designs. Requires a mortar or silicone joint between the units – Unlike curved bent glass (which is one solid piece of glass) the curved block wall will have a joint (which will vary between 1/8” and ¼”) between the blocks. 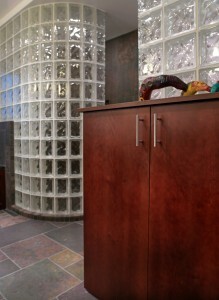 Frosted or colored glass blocks – using over 104 different colors you can add a distinctive look to your wall project. Glass block tiles – Glass tiles can be fused on to the curved blocks for a sleek, contemporary style. Combining different sizes – you don’t have to use all the same sized blocks – mix it up with 2 or more different sizes to create a one of a kind design. If you have any questions or words of wisdom about using curved blocks please comment below. If you need any help designing a curved walk in shower, partition wall, or decorative glass column or want a quotation contact Columbus Glass Block (614-252-5888), Cleveland Glass Block (216-531-6363), or Mid America Glass Block (513-742-5900) of Dayton and Cincinnati. For a complete bathroom remodeling project contact Cleveland Design & Remodeling (216-531-6085), Columbus Design & Remodeling (614-252-7294) or Bath Doctor of Cincinnati (513-742-6674). Pittsburgh Corning to Stop Glass Block Manufacturing – Now What?